This unique method of body work comprises subtle but powerful movements. During the sessions, participants regain mobility, vitality, health and independence. It can be understood as a voyage through the body and its history, Antigymnastique draws attention to how the body has quietly reorganised, adapted and protected itself over time. Participants are led towards a reawakening and rediscovery of the body. Initially some of the muscles seem foreign, but slowly new connections develop between the poorly known muscles and the brain as muscular vocabulary becomes richer and new possibilities of movement are rediscovered. Contractions, stiffness and muscular joint pains that shrink and restrain the body disappear allowing the body’s to regain its natural range of movement. 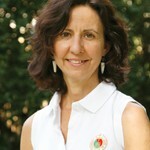 Paloma Rodríguez Hergueta es profesional certificada de Antigimnasia® con la formación acreditada por Thérèse Bertherat, creadora de este método corporal.